Soup season has definitely arrived, and I love soup. And of course, I enjoy making it from scratch. Yes, it’s a lot more time consuming that popping open a can or pulling open a box, but it’s so much healthier, wholesome, and delicious. Those other soups contain vegetable oils, MSG (which has many aliases), GMOs, and BPA which has been studied as a serious hormone disruptor. Over time I will post more of my favorite soup recipes, but this one is for a non-dairy butternut squash soup. 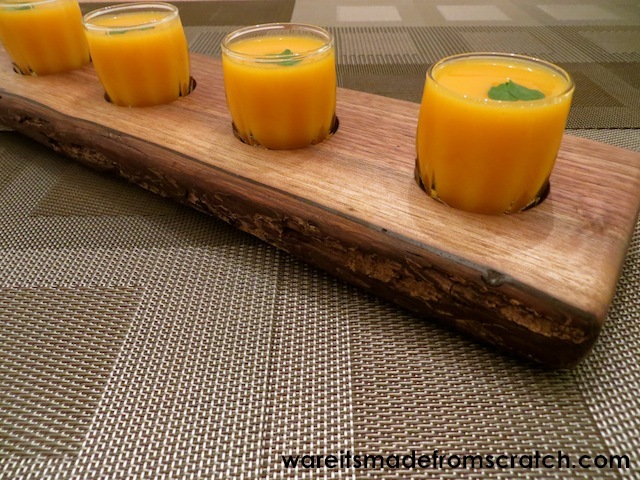 At my wedding, one of my favorite hors d’oeuvres served during cocktail hour was a pumpkin soup passed around in shot glasses. It was a clever way for people to have a taste of the autumn season without having to sit down or walk around with a bowl. I think the shot glass idea is a fabulous one for serving a taste of the season at a holiday gathering or other festive event without having to make pots and pots to adequately serve guests bowl-size portions. Pour olive oil into a large pot over medium heat. Add the onions and stir. Add sage, thyme, nutmeg, salt, and pepper. Stir. When onions are translucent, add apples and butternut squash. Add broth and bring to a boil for about 7 minutes. Turn heat down and let simmer for 30 minutes or until butternut squash is soft. With a ladle, transfer ingredients from pot to blender. Only fill up half way and pulse until pureed. Transfer from blender into another pot. Continue until finished. Mix soup to even out all ingredients. If desired, add more seasoning to taste. Serve or store in glass jars in the fridge.